Gas log fireplaces are the perfect addition to any Chicago home. Get a free quote from Early Times and join thousands of happy homeowners who have trusted us. If you’re looking for an upgrade to your fireplace, the best option is a gas log set. They’re the perfect combination of beauty, warmth and low-maintenance. Your Chicago home would greatly benefit from a gas log fireplace. Early Times Home Solutions has a wide selection of gas log fireplaces for you to consider. They offer the warmth and comfort of a wood burning fireplace without the hassle of buying real wood and having to start a fire. 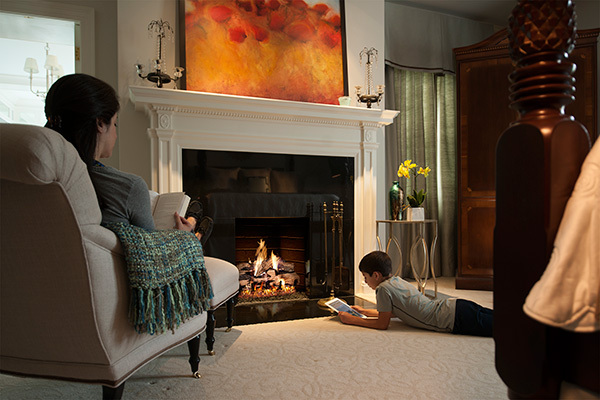 Our gas log fireplaces are easy to maintain and become the centerpiece of whatever room they’re in. Get a free quote now and see why thousands of homeowners have trusted Early Times since 1985. The first thing you’ll notice about a gas log fireplace is that they’re stunningly beautiful. In the past, gas log fireplaces couldn’t hold a candle to the look of real wood, but things have changed. Today, you can hardly tell the difference between the two. There are many reasons why gas log and wood fireplaces look so similar now. One of the biggest reasons is because the ceramic logs are hand painted to match the details of a real wood log. The logs sit atop a steel grate similar to what you would see with a wood burning fireplace. Below the grate is a layer of sand with glowing embers. 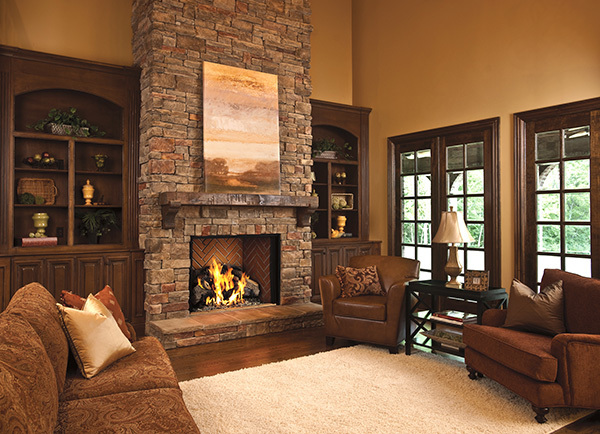 When the fireplace is used, it provides warmth and a look that’s almost identical to a real wood fireplace. 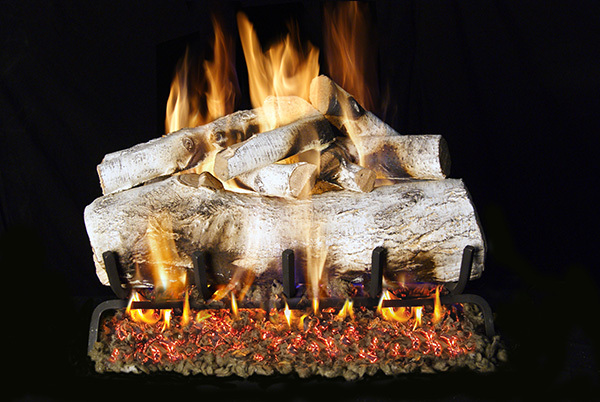 Gas log fireplaces do more than just look pretty. As you already know, they produce much needed heat. With the winters being extremely cold, the warmth from a gas log fireplace will help make the room very comfortable. The cost to warm your home is much less with a gas log fireplace. You need to buy wood way more often for a wood burning fireplace which will become a major expense. Having the wood delivered and maintenance of a wood burning fireplace are also huge expenses you’ll need to consider. Wood burning fireplaces can be a nightmare to maintain. Plus, your chimney will need to be cleaned frequently to prevent fires. All of these problems can be avoided with a gas log fireplace. Gas log fireplaces use ceramic logs which don’t need to be changed as often as wood logs. Also, they don’t leave a massive mess behind because they don’t char and burn. This also limits the amount of soot that cakes the lining of your chimney. This is because they have a cleaner, more efficient burn. It’s very easy to care for a gas log fireplace. The fireplace itself will need to be cleaned every now and then but not every use like a wood burning fireplace. It’s also recommended to have your chimney inspected once per year to make sure it’s properly cleaned and working well. One of the worst parts about getting a wood burning fireplace is the set up. In order to get a fire started, you need to have enough wood and then start the fire. It could take a while before the fire gets big enough to look good and warm the room. Gas log fireplaces are much easier – they’re so much more convenient than their wood using counterparts. With the simple push of a button, your home can be beautiful and warm. With the look and feel of real wood, your guests will be blown away. 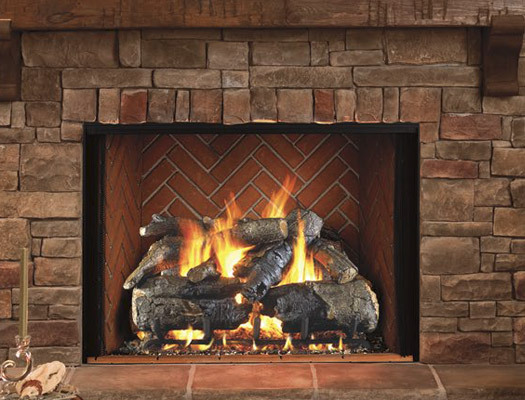 Having a gas log fireplace is the perfect option for homeowners in Chicago. They’re easy to start, even easier to clean and heat your home to a comfortable temperature. Plus, they look exactly the same as a wood burning fireplace. Early Times offers many different styles of gas log fireplaces. We’ve served thousands of homeowners since 1985 and would love to help you find the perfect fireplace for your home. Get a free quote now and start your fireplace project today!